Glitz 'n' Glam display after I got done taking pictures of possible dupes in the store. 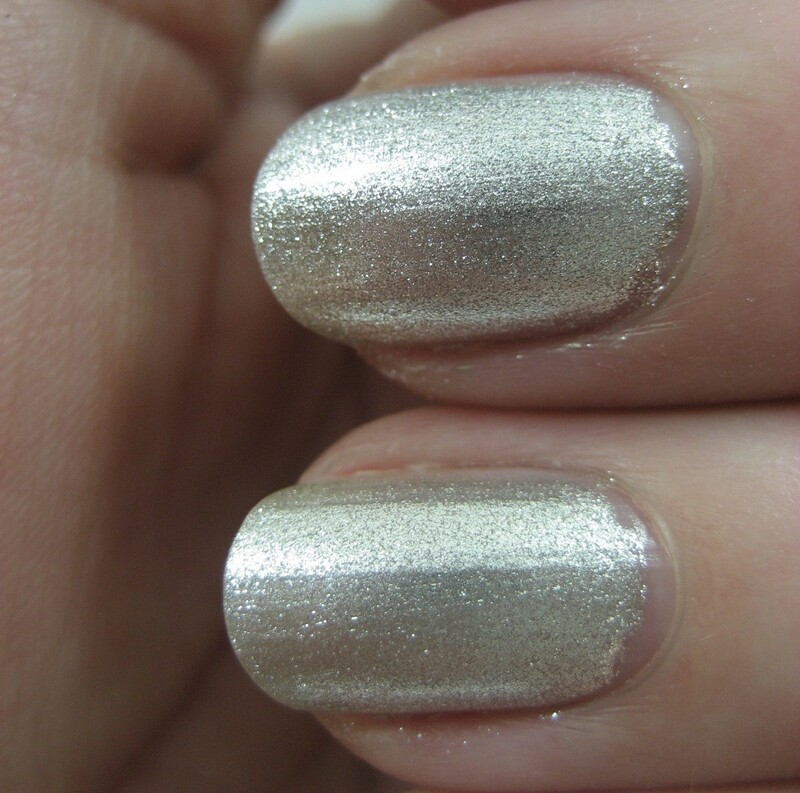 First up is Toast, which is a silver foil (or foil-y shimmer or metallic shimmer or whatever you call this finish). I don't actually need another silver foil, but for 99 cents I figured I'd get it for research purposes. It went on in two coats. 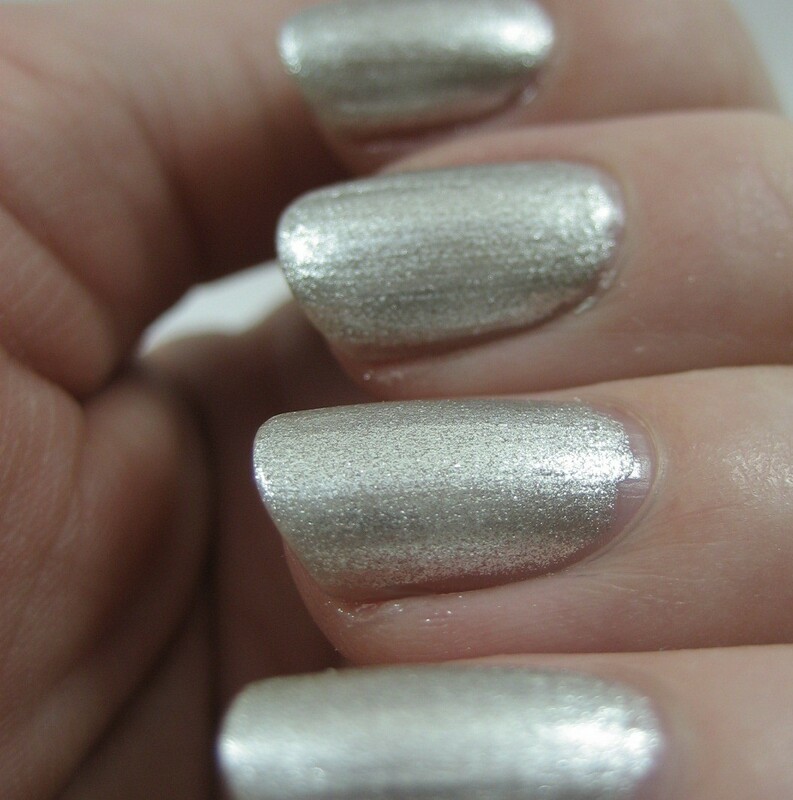 I compared it to one of my favorite silvers, Orly Shine, which is also a two-coater. 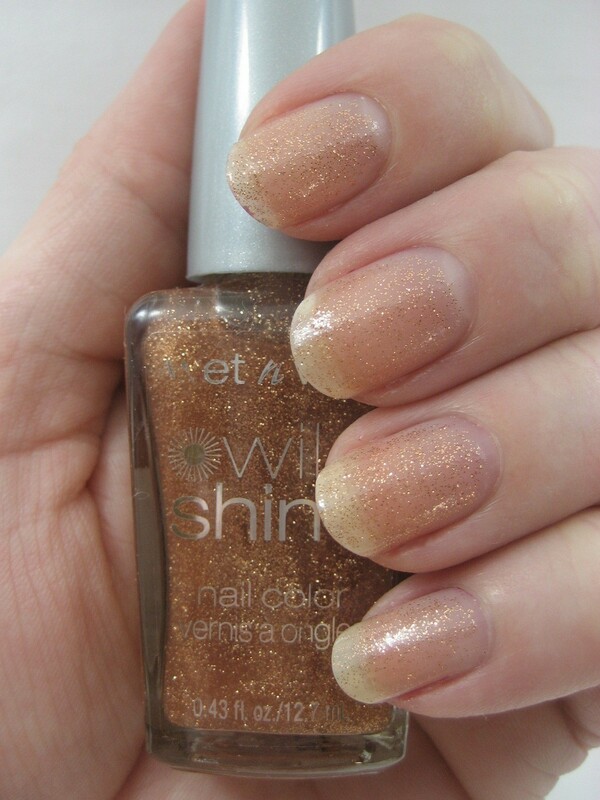 Shine is a bit more sparkly and leans slightly cooler-toned than Toast, but the differences are very small, so I consider these two interchangeable. Top to bottom: Toast, Shine, Toast, Shine. 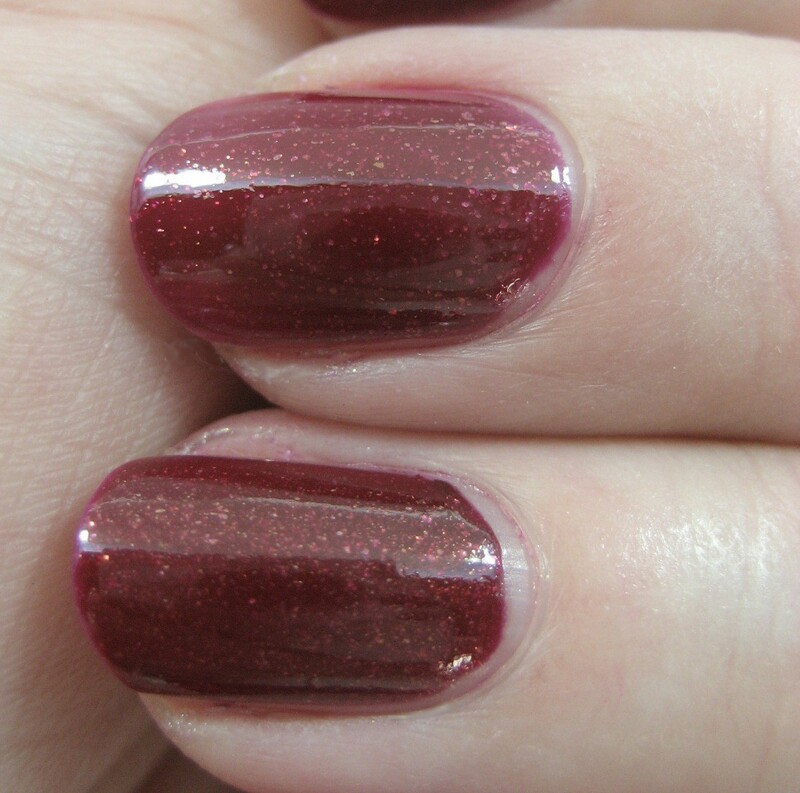 Next I have Extravaganza, a pretty red shimmer with gold highlights. Like Toast, I used two coats. 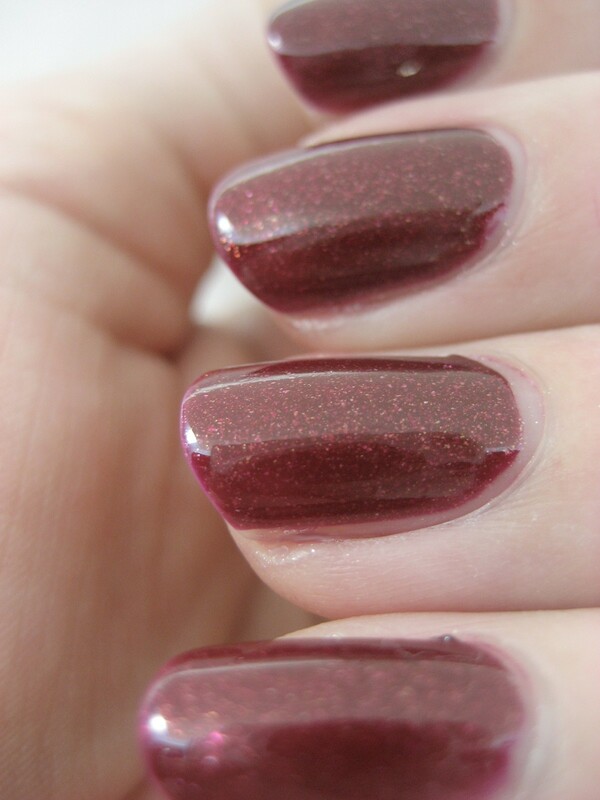 This one reminded me of Sally Hansen Xtreme Wear Fireberry Red. 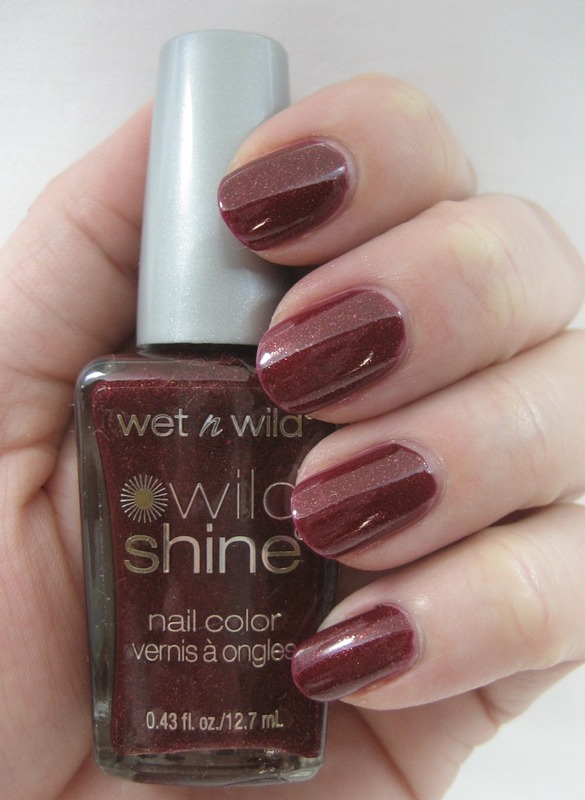 The Sally Hansen was a little bit lighter; I needed three coats to make it about as deep as the Wet 'n' Wild. Other than that, they're very similar. Top to bottom: Extravaganza, Fireberry Red, Extravaganza, Fireberry Red. Fireberry Red (top), Extravaganza (bottom). 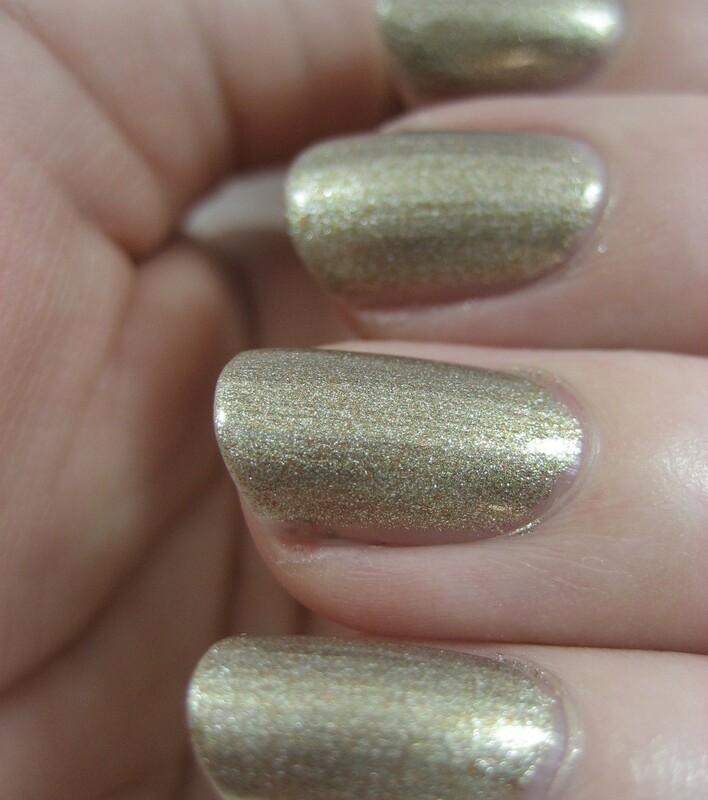 Tipsy is coppery gold glitter that is perfect for accentuating any yellow staining you may have on your nails. Even at three coats, this was nowhere near opaque. In the bottle, I thought it looked like Sally Hansen Complete Salon Golden Ticket, but the glitter in Golden Ticket is much denser. 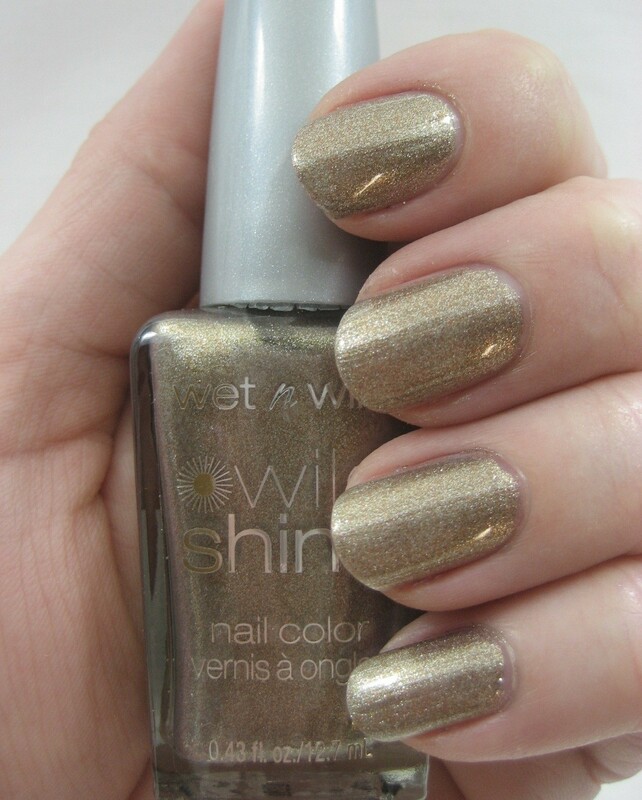 3 coats each: Golden Ticket (top), Tipsy (bottom). 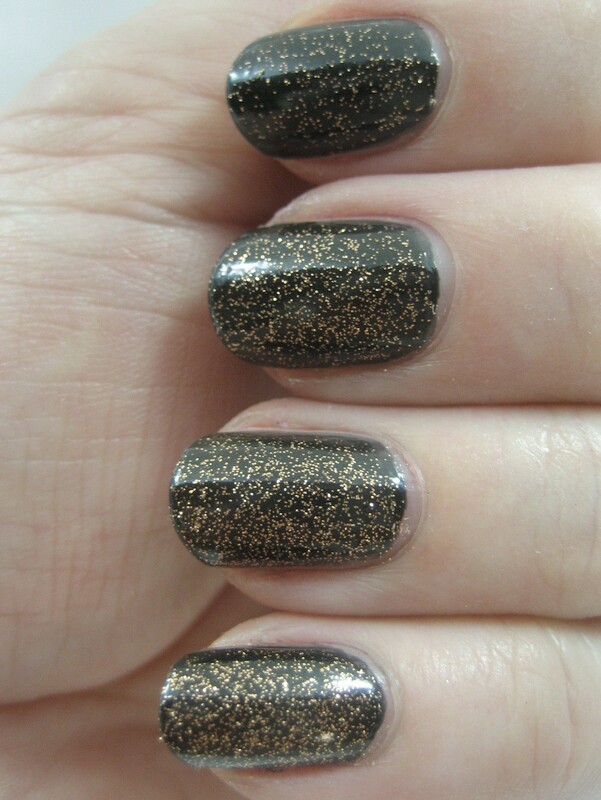 Since Tipsy is obviously a layering polish, I tried it over Borghese Notte Black. Tipsy over Notte Black; top to bottom: 1 coat, 2 coats, 3 coats, 4. 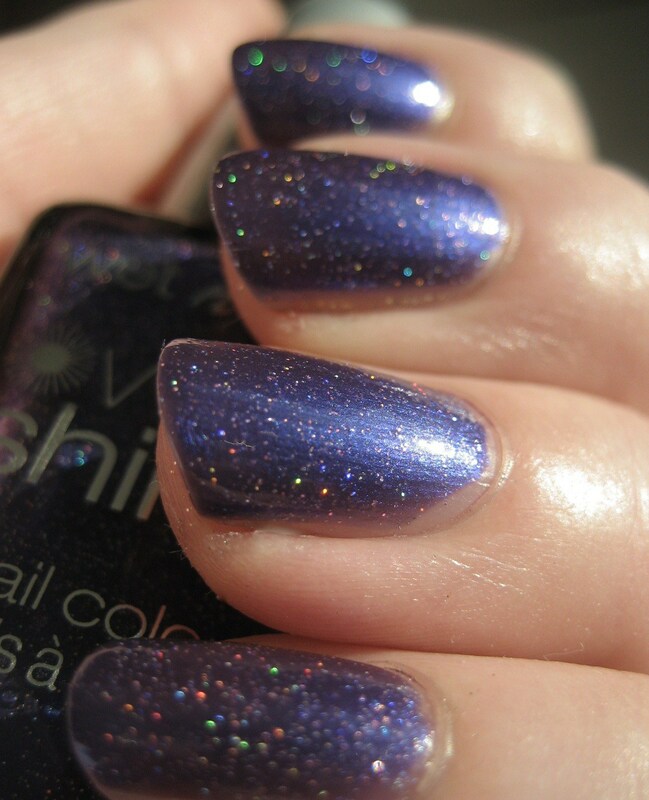 Midnight is a blue-leaning purple with holo glitter scattered in it. I can't decide if the base color has a shimmer to it or not; if it does, it's subtle. 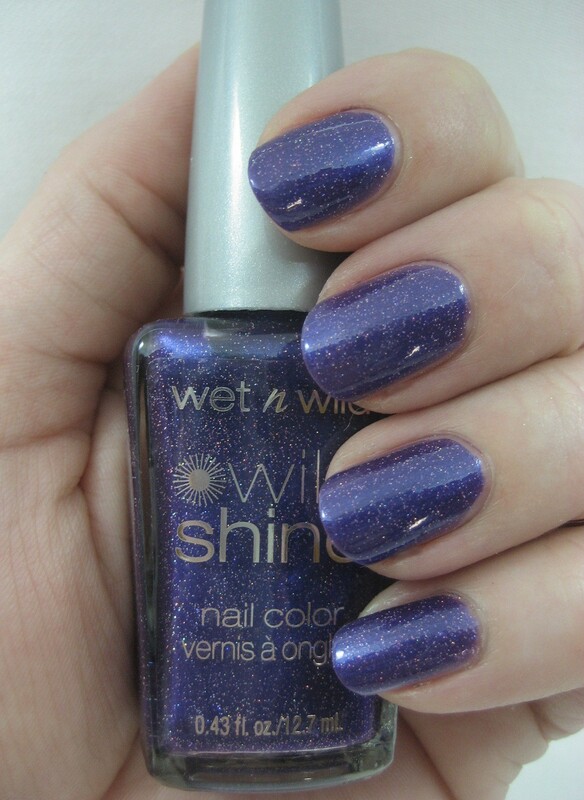 I used three coats of this; I probably could have done two but I have trouble putting purples down sometimes. Since it has a holo component to it, this one really shines when it's outside in the sunshine. Near as I can tell from looking at it, it is a good match for the discontinued Wild Orchid color (still haven't found the bottle my spreadsheet says I own). 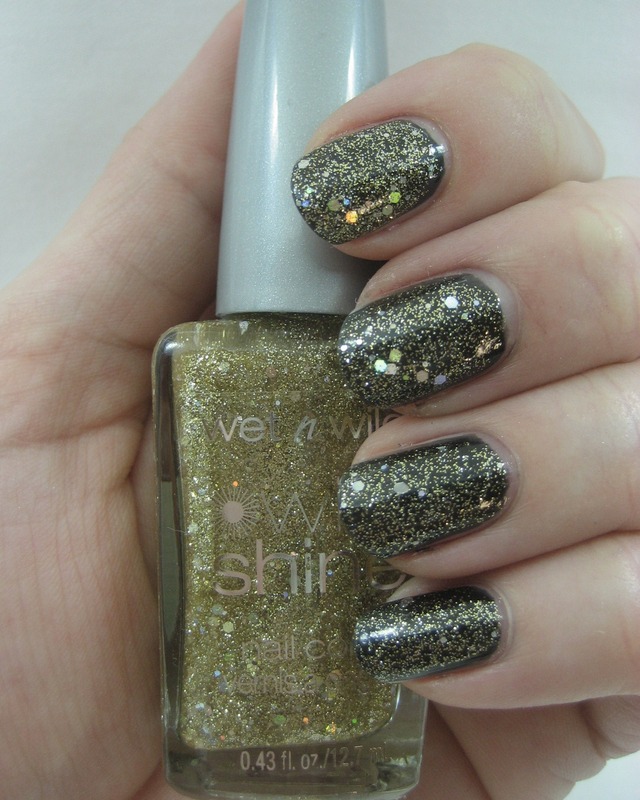 Champagne, the one that matches Shield from the Craze line, is a gold/silver/copper/tan shimmer. All those particles combine to make a sort of antique gold color. I used two or three coats of this one (that's what my notes say 2 - 3 coats; I don't know what I was thinking when I wrote that). 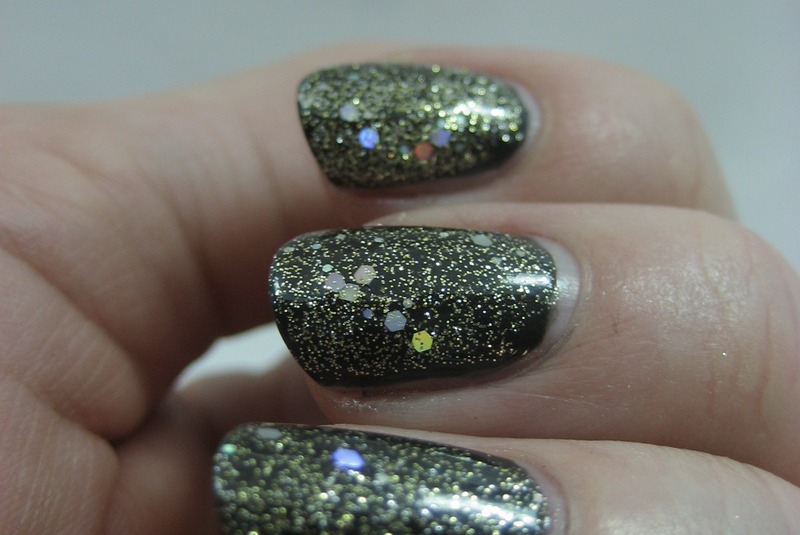 Finally, I have Fireworks, which is gold glitter in a clear base with some holo hex glitter tossed in for added bling. Since I had no doubt this one was meant for layering, I tried it over Notte Black. I got a lot of glitz from only one coat of Fireworks. I'm fairly sure I've seen this sort of effect before but I couldn't immediately find a match in my stash. Wow, that was a lot of pictures. If you got this far, let me know in the comments you'd rather I split up big entries like this into parts. Oooh I love the sparkly ones. Thanks for the swatches. Make your posts any way you like. It is your blog. Oh, and great swatches. There are a couple of polishes that need to become mine. Midnight kind of reminds me of Sally Hansen Cosmic Blue only it looks less gritty and appears to have a more pronounced holo effect. I really like Toast and Fireworks and luckily I don't own any other Wet and Wild polishes so these wont be dupes for me! Thanks for the swatches! Thanks for the awesome swatches, girl!! Out of these, I definitely like Midnight best. But you know, Fireworks looks to me like a version of Chanel Illusion D'Or. They're definitely not dupes, but it was the first thing that sprung to mind when I saw the pictures. But if you think they look too bulky with the main page, then you can always put in a jump break and bam, best of both worlds. I have to say the Fireworks looks like an exact match for Comet from the Wet n Wild Vixen's Mittens 2010Holiday Collection. nice swatches! im going to buy the wet n wild ones! I love Midnight and Fireworks! Definitely going on my lemming list now :D.
Love fireworks! I don't think it's $0.99 where I am though. Lucky you! I love the photo-laden posts with your search for dupes. You have an incredible knack for finding those dupes too. I love your details and lots of pictures. This is my favorite nail blog! I like Tasha's idea of posting your all-time faves. I think a lot of us would appreciate that. After reading your previous WnW post I went on a hunt for Midnight and finally found one today! It really has some depth to it along with that very pretty halo shimmer/glitter. Don't mind all the pics, the more the merrier. I like big posts and I cannot lie... :) Love lots of pics...keep them together! I love love love lots of pictures. I have never been able to buy anything with 99c. A standard chocolate bar = $1.30 in Australia. I could perhaps buy some sticks of gum (75 c) but defn not a nail polish. Sad. Thanks for this post!